Researchers: Clotaire Michel, Krisztina Kelevitz, Nicolas Houlié, Zhenzhong Su, John Clinton, and Domenico Giardini, ETH-Zurich; Benjamin Edwards, University of Liverpool; and Panagiotis Psimoulis, University of Nottingham. Analysis of past earthquakes shows that GPS/GNSS sites can provide high-rate, low-noise data to determine peak ground velocities for earthquakes of magnitude greater than 5.8. Geodetic observations can augment conventional seismic observations because they record at different frequencies utilizing existing real-time to near real-time networks. The geodetic-derived ground motion can help with earthquake early warning, emergency response and earthquake engineering. In Japan, the GNSS Earth Observation Network (GEONET) is a dense system of ground-based GPS/GNSS sites that are primarily used for precise point positioning for navigation, surveying and related activities. GEONET is also used for geoscience research to determine plate motions, earthquake characteristics, volcano dynamics and other Earth processes. 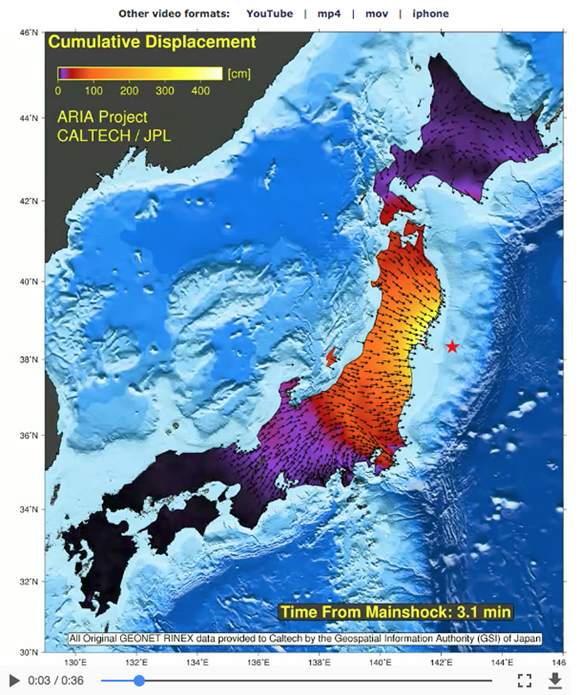 The dense network and the frequent earthquakes allow for testing of geodetic data for ground motion measurements during and after an earthquake. Previous analysis of the dense network of GPS/GNSS data in Japan for the 2011 M9.0 Tohoku-Oki earthquake shows that maximum ground velocity maps can be generated. 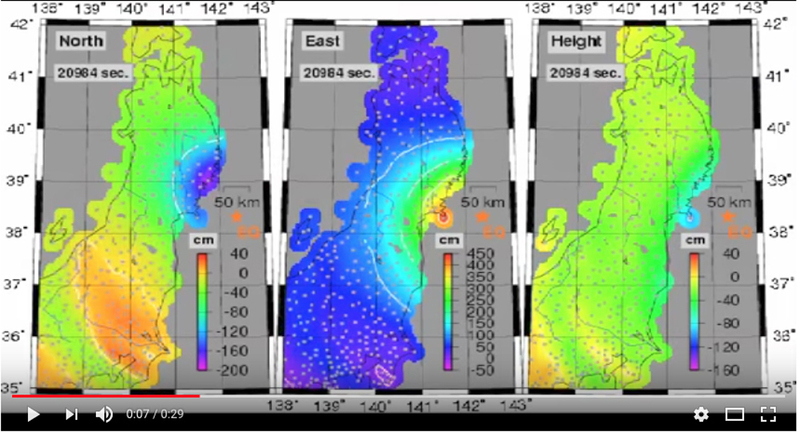 In particular the geodetic data captured the large amplification of ground motion in some deep basins in Japan. As a first step to testing geodetic data for ground motion measurements, the authors modeled the vertical and horizontal spectra for rock sites in Switzerland and Japan. Then the noise spectra of GPS/GNSS displacement time series were characterized using different techniques and different models. GPS/GNSS instruments can record strong ground motion for earthquakes of magnitude greater than 5.8 within epicenter distances of 10 to 30 kilometers because the ground motion signals exceed the noise of the instruments. 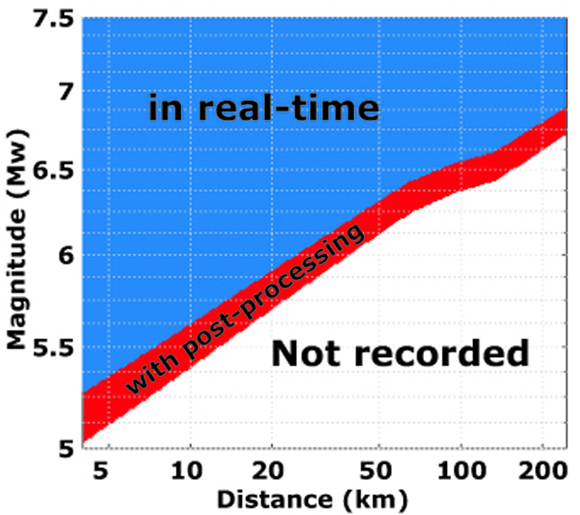 Retrospective analysis shows that increasing the sampling rate of GPS/GNSS receivers by 2 to 5 times would further optimize ground motion measurements for a larger range of magnitudes and epicenter distances. Adding more real-time to near real-time GPS/GNSS strong motion measurements would help to advance earthquake early warning and rapid assessment of damage for earthquake response. Movie of ground motion measurements recorded by GEONET for the Tohoku-Oki earthquake. Simulations of displacements and GPS velocities recorded by GEONET for the Tohoku-Oki earthquake. Simulations provided by JPL/Caltech. The Potential of High-Rate GPS for Strong Ground Motion Assessment, C. Michel, K. Kelevitz, N. Houlie, B. Edwards, P. Psimoulis, Z. Su, J. Clinton and D. Giardini, Bull. Seismol. Soc. Am., v107, pp. 1849-1859, 2017, doi:10.1785/0120160296. Send questions or comments about this page to science unavco.org.